A new top V8 model is making its debut in Geneva in the form of the CLK 63 AMG. The 100% AMG-developed 6.3-litre V8 engine under the bonnet promises a truly memorable driving experience. Available in both Coupé and Cabriolet guise, the CLK 63 AMG eclipses the power and torque figures for any other model in this segment with a maximum output of 354 kW/481 hp and 630 newton metres of peak torque. Compared to its predecessor, the CLK 55 AMG, power has been upped by 84 kW/114 hp (+31 percent) and torque by 120 newton metres (+23 percent) in the CLK 63 AMG. With new AMG high- performance composite brakes, a new AMG sports suspension, new AMG 18- inch light-alloy wheels plus exclusive and dynamic standard appointments, the new CLK 63 AMG is the sportiest and most elite CLK to date. The new AMG 6.3-litre V8 engine delivers truly explosive performance: the CLK 63 AMG Coupé sprints from standstill to 100 km/h in 4.6 seconds (predecessor: 5.2 s), with the Cabriolet taking 4.7 seconds (predecessor: 5.4 s). The electronically limited maximum speed is 250 km/h. The majestic power delivery of the Mercedes-AMG V8 engine permits either electrifying acceleration or relaxed cruising in a high gear with ample power reserves. The new 6.3-litre V8 engine from AMG is the first in the world to combine the high-revving concept with a large displacement. 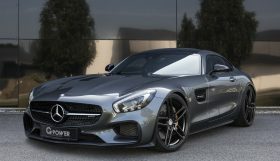 Developed exclusively by AMG, this high-performance engine delivers 20 percent more torque than comparable naturally aspirated engines with a similar power rating. AMG V8 naturally aspirated engine with an array of high-tech features Made entirely from high-strength aluminium, the V8 naturally aspirated engine is packed with a wealth of fascinating racetrack technology that reflects AMG’s rich motorsport heritage. The vertical arrangement of the intake and exhaust ports together with the sophisticated new variable intake manifold featuring two integral throttle flaps results in superlative cylinder charging. The use of bucket tappets in the cylinder heads paves the way for a stiff valve train and therefore high engine speeds. Variable camshaft adjustment, an extra-rigid closed-deck crankcase and cylinder walls with a revolutionary new LDS coating are further attributes of this ultra-sophisticated V8 engine made by Mercedes-AMG. This unique combination of a fast-running design and a large displacement achieves the best of both worlds: exhilarating high-revving flexibility accompanied by high pulling power at low engine speeds. 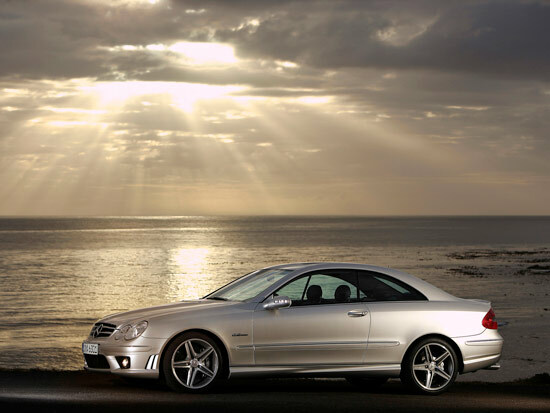 The decidedly sporty character of the CLK 63 AMG manifests itself in the form of tremendous agility and dynamic responsiveness across all engine speed ranges. The new AMG V8 delivers 500 newton metres of torque to the crankshaft as low down as 2000 rpm, while the maximum of 630 newton metres is on tap at 5000 rpm. 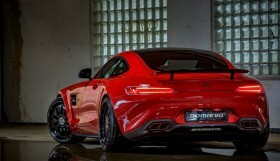 The new AMG V8 unit promises dynamic acceleration, instantaneous pickup and sheer driving pleasure at the highest level. 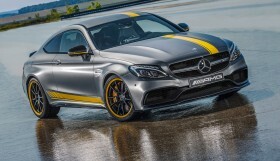 With its new, sporty AMG soundtrack which was fine-tuned during an extensive series of tests, the eight-cylinder powerpack from Affalterbach offers all the spine-tingling excitement of a high- revving V8 naturally aspirated engine that makes its presence both heard and felt at any engine speed. The new AMG SPEEDSHIFT 7G-TRONIC transmission is the perfect complement to the dynamic power delivery and can be operated using the AMG shift paddles on the steering wheel. The seven-speed automatic transmission caters effortlessly for both a dynamic driving style and a more comfort-orientated approach. Three shift modes specially configured for the performance characteristics of the AMG V8 engine enable its tremendous power to be harnessed to best effect. Selectable using a switch in the centre console, the shift modes in the CLK 63 AMG – “S” (Sport), “C” (Comfort) and “M” (Manual) – differ in terms of their shift characteristics and shift speeds. In the manual “M” mode, the driver can truly harness the immense pulling power generated by the V8 engine, as there is no automatic downshift under full throttle or during kickdown; the transmission remains in the selected gear. Plus, AMG SPEEDSHIFT does not automatically execute an upshift when it reaches the engine speed limit in manual mode either, which allows drivers with a particularly sporty streak to make even better use of the power at their disposal. As the rev speed approaches the lower limit, the transmission automatically changes down a gear. AMG 18-inch light-alloy wheels and new AMG composite brakes Equipped with a retuned AMG sports suspension, high-sheen AMG 18-inch light- alloy wheels featuring a titanium grey painted finish and new five-spoke styling, as well as wide-base tyres (size 225/40 at the front and 255/35 at the rear), the CLK 63 AMG has precisely what it takes to deliver sporty handling and high-speed cornering. New AMG high-performance composite brakes can be found at the front wheels, with internally ventilated brake discs providing sure stopping power at the rear. The CLK 63 AMG makes no secret of the fact that it is a range-topping sports model: the powerful AMG bodystyling injects even more dynamism into the already exciting design. The new front apron with its bolder lines, air outlets at the sides and integral fog lamps, the side skirts and the rear apron together produce an overall look that is bristling with character. The “6.3 AMG” lettering adorning the front wings adds further lustre. The spoiler lip on the boot lid reduces the lift acting at the rear axle by over 50 percent. At the rear of the CLK 63 AMG Coupé, the AMG sports exhaust system with two sets of chromed twin oval tailpipes provides both a visual highlight and an acoustic highlight with its sonorous V8 sound. 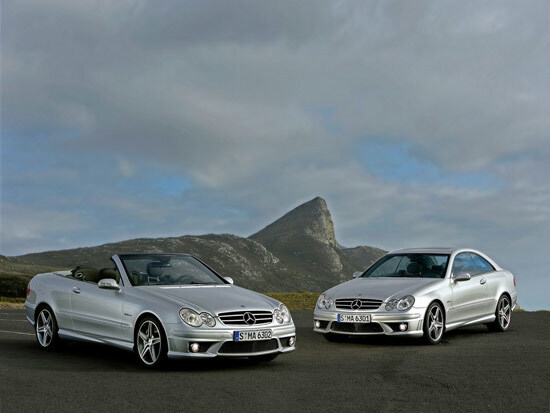 The CLK 63 AMG Cabriolet is fitted with an AMG sports exhaust system ending in a single chromed twin oval tailpipe. Sportiness and exclusivity are the predominant themes inside both V8 models too. AMG door sill panels, special AMG aluminium trim elements with decorative chrome strips and the new AMG instrument cluster with a 320-km/h speedometer dial create a unique ambience without compromising at all on practicality. Also new is the AMG main menu in the instrument cluster, which displays the currently engaged gear and recommended upshifts in Manual mode, plus either the engine oil temperature or the battery voltage as well as the RACETIMER. The new RACETIMER function allows the driver to record lap times on private racing circuits, storing not only the time for the fastest lap but also the average and top speeds as well as the lap length. The new silver-coloured aluminium AMG shift paddles on the AMG ergonomic sports steering wheel are particularly eye- catching. The electrically adjustable AMG multicontour sports seats are heated and come upholstered in exclusive nappa leather with an attractive cross-piping design. 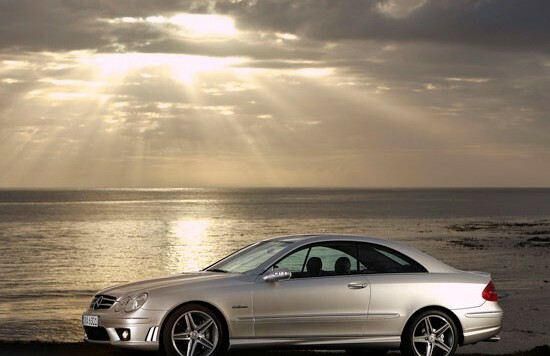 The market launch of the new CLK 63 AMG is due to commence in the second quarter of 2006. KW springs with variable lowering thread for Mercedes-AMG GT!